This is just the third post in a five-post series giving you all the information and background you need to comfortably teach counting skills to your preschooler. Because it is more than just…well…many preschool teachers can’t identify a definition for quantification, or at least how it applies in the preschool setting. If you’ve missed the other posts, be sure to read them below! Counting – Part 2 (You are here). And if you want to stay updated on future posts, be sure to subscribe! By definition, counting means to take an account of a group of items to come up with a total. Preschoolers love to count. They relish in participating in counting games, songs, and rhymes, but to truly be capable counters, children must be able to do much more than simply recite 1, 2, 3, and so on. In fact, according to my favorite book Teaching Mathematics in Early Childhood by Sally Moomaw, there are five principles of counting that children must master. One-to-one correspondence is the understanding that each item is counted only once and one at a time. For example, when counting a set of counting bears , the child does not count any one bear twice and does not count any bear with another, assigning the same number. Cardinally is the understanding that counting is quantitative and the last number named is the total of the group. For example, when a child is counting a group of five butterflies, she counts 1, 2…5 with the understanding that the number of butterflies counted is five, not any of the previous numbers counted. The order of counting does not affect the total. For example, when counting a line of buttons, the buttons can be counted forward, backward, or in any order and the total amount will remain the same. Eventually, children come to understand that both objects and ideas can be counted. One example of this is actually in phonological awareness lessons where children are asked to listen for and count words in sentences. Despite who is actually responsible, there is no doubt that without adequate counting skills children have little chance of being successful in mathematics. These are some of the most popular activities or teaching children to count. These counting printables are super for circle time or math centers! 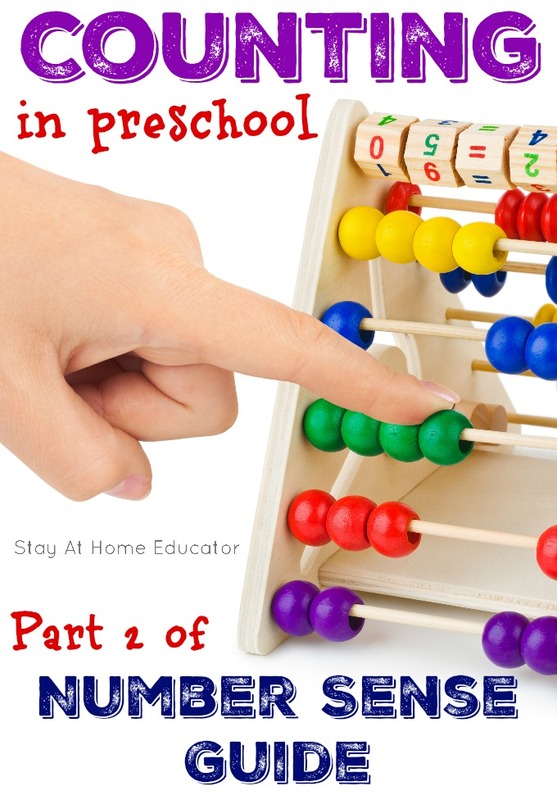 WANT to Learn More about Teaching Number Sense in Preschool? Remember, this is just the first installment of a five post series. Over the next few months, I’ll be writing in detail about each of the following components within teaching number sense to preschoolers. If you subscribe, you won’t have to worry about missing this important information!